This guide will walk you through the steps to install XenDesktop/XenApp infrastructure. First we will install the product, followed by discussing the available options within the component. With Citrix XenDesktop/XenApp 7.x Citrix delivers a new management console called Citrix Director. Citrix Director is used for showing the current usage information and is also the tool for supporting the end-users. Citrix Director is just a StoreFront running an Internet Information Server. I install Directory normally on the same server as where I install StoreFront, but it can be installed on any IIS server without issues. For smaller deployments it can also be installed on the Delivery Controller as well. The latest version of Director is available within the ISO of XenDesktop/XenApp 7.8. Citrix advises to install Director using the installer GUI, but you can use the MSI as well. 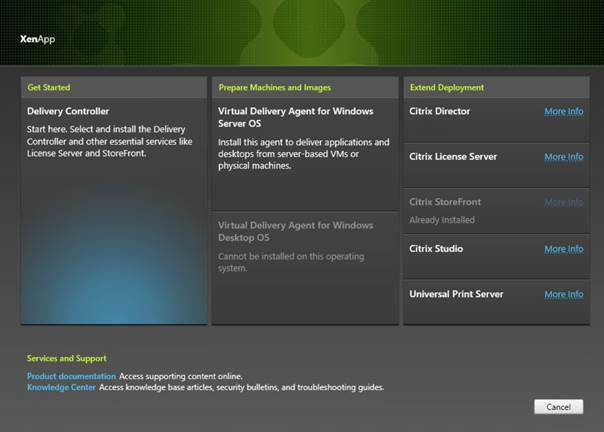 For this article I will use the advice of Citrix and install Directory via the installer GUI. I will use the machine where StoreFront is installed. 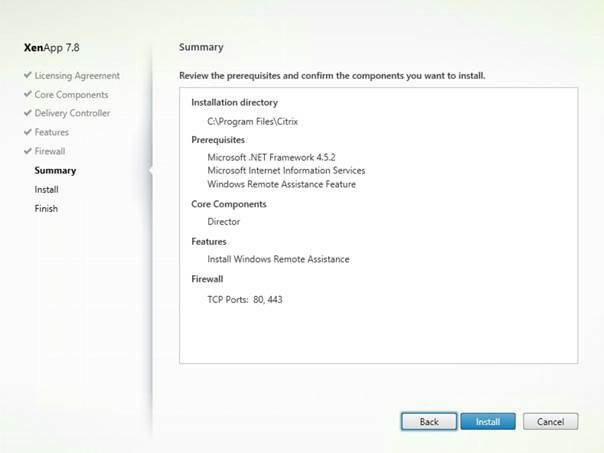 After starting the installer GUI, the Citrix Director Installation start can be found on the right side at the Extend Deployment component. After selecting the Citrix Directory the installation wizard is started. 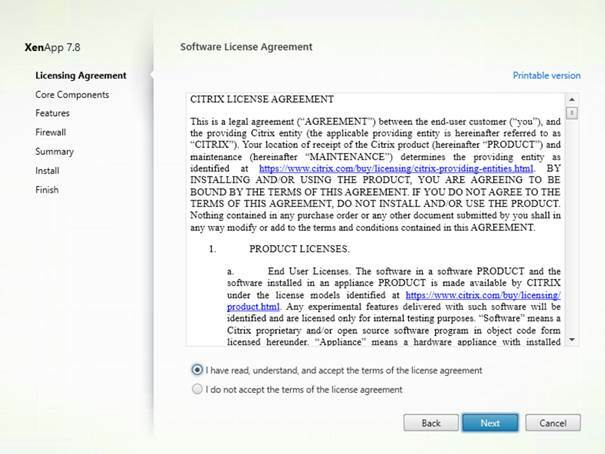 The first window that appears shows the license agreement, which logically needs to be confirmed before the installation will continue. In the next window the components that will be installed will be displayed. In this case it’s only Director as we selected that component particularly. Director is communicating with a Delivery Controller to show the information. When Director is installed on a non-Delivery Controller server it needs to know the Delivery Controller to communicate with. 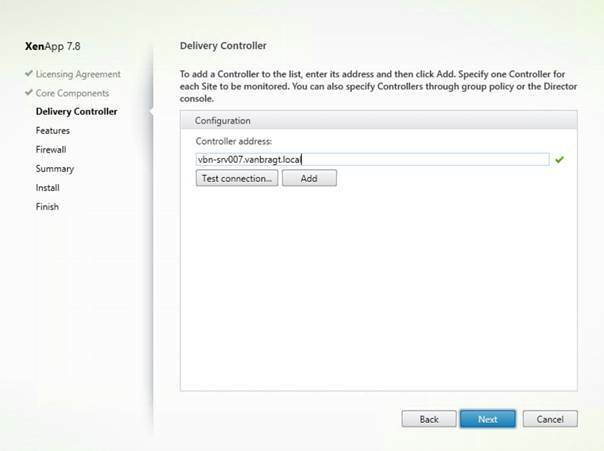 With the later versions the installation wizard asks for the Delivery Controller address as shown in figure 4. 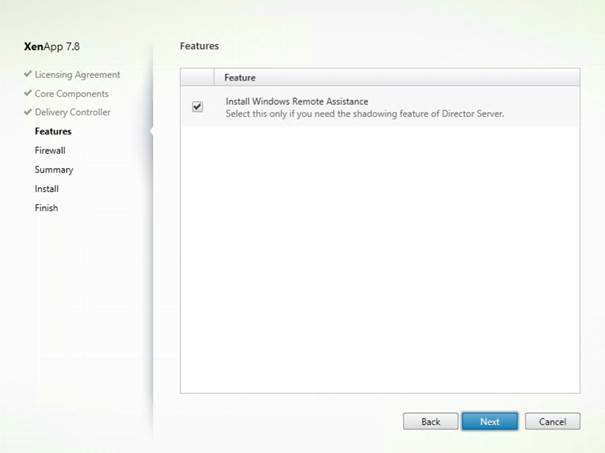 Via Directory, Remote Assistance can be done to activate this option Windows Remote Assistance needs to be installed. Check if this option is enabled during the installation wizard. 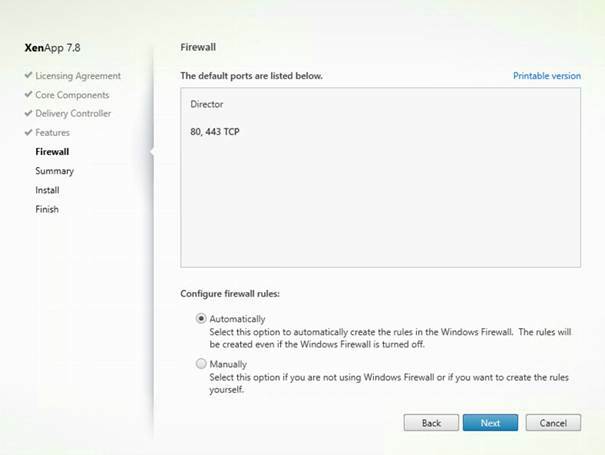 The installation wizard can automatically add the required port to the Windows Firewall arranging that communication with the Directory can be established. 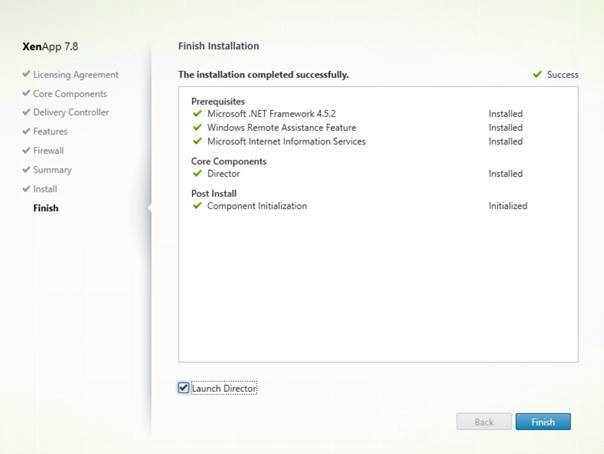 Next the summary of the installation wizard is shown. 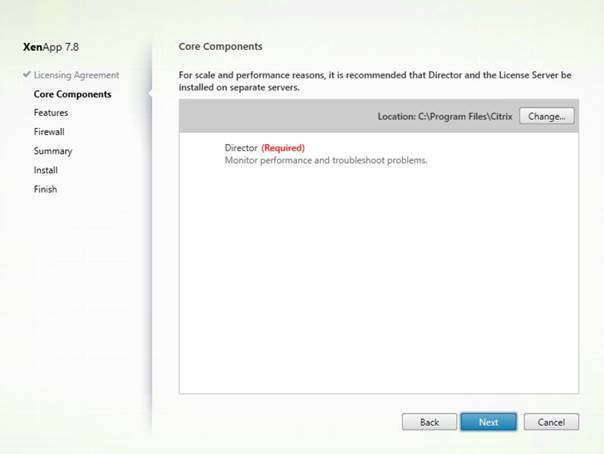 Just as the other components of the XenDesktop infrastructure Director will install the prerequisites. To show all prerequisites I took the screenshot from another installation. As already mentioned IIS is required and also .Net Framework 4.5.2 will be installed. For some prerequisites a reboot is required. The installation wizard will show a message that a reboot is required. The reboot will be done automatically, to continue the installation you need to logon again on the machine. After logging on the installation will continue automatically. Director can be started automatically if needed. There is actually not much configuration done on the Director. The most important parts are the connection to a Delivery Controller and optionally adding the NetScaler into Directory. This can be done via directorconfig.exe available in C:\inetpub\wwwroot\Director\tools. Some settings are also available via the IIS administrative console. For this article I will only connect to a Delivery Controller. During the wizard I have added the Delivery Controller, however I have seen situations that this setting was not applied to Directory configuration. 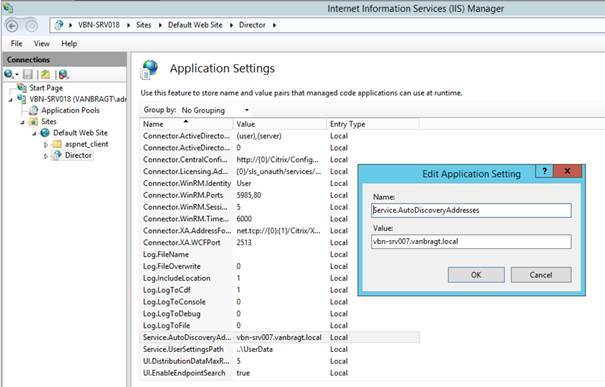 To add or change a Delivery Controller you can use the directorconfig.exe tool or use the IIS console. For the article I will use the IIS console. In the IIS console go to the Director folder within the Default Website. Select the Application Settings button in the right pane. Go to Service.AutoDiscoveryAdress and enter the FQDN of a Delivery Controller. You only need to add one Delivery Controller per site, the others are automatically detected according the Citrix documentation. Director is accessed via a web browser. Both http and https are available, logically https is advised, otherwise the passwords are sent plain text over the network. By default you need to enter your credentials including the domain name. You can change this behavior via two methods. The first one is enabling Windows Authentication, so the users don’t have to enter any credentials anymore. Remember that when Director is installed on a different machine than the Delivery Controller you also have to enable Trust this computer for delegation to any service on the delegation tab of the AD computer object. Another option is to pre-populate the domain field, so only the user credentials need to be entered. This is done by editing the logon.aspx file in C:\inetpub\wwwroot\Director. At the line <asp:TextBox ID="Domain" runat="server" CssClass="text-box" ></asp:TextBox> add Text="Domainname" for example <asp:TextBox ID="Domain" runat="server" Text="VanBragt.local" CssClass="text-box" onfocus="showIndicator(this);". After the configuration of the Delivery Controller we are ready to start using Director. Users that would like to use Directory should be assigned to a role within the XenApp/XenDesktop Administrators. The roles Machine Catalog Administrator and Host Administrator roles don’t have access to Director. The Read Only Administrator can view the information, but cannot execute any commands. The Help Desk Administrator role has limited access within Director. The role can access only the Help Desk and User Details, can shadow a user's session and perform commands for that user. 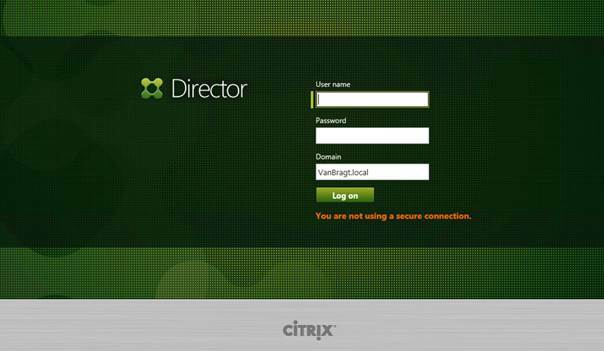 The roles Full Administrator and Delivery Group Adminstrator have full access to Citrix Director. When logging in with the Full Administrator and Delivery Group Administrator, Director will start with an overview of the environment: User Connection Failures, Failed Machines, License status, Delivery Controller status and connected sessions. Most of those overviews are clickable, which will lead to a more detailed view. Basically you will enter the Filter part of Director, which is also available as a button on the overview pane. In selected Sessions Connected in the Home screen which leads directly to the Filters – All connected sessions, with a filter based on session state is active. You can also go directly and create your own filtered results for machines, sessions and connections. For each part several datasets are available which can be tuned further based on filters. Filters will be mainly used for creating reports about the current situation. The second option is the trends component. Within Trends you have the ability to create reports based on historical data. The time period varies between two hours of last year. However it depends on the licenses type you have. For Enterprise a maximum of 7 days are stored in the database, platinum licensed environment can store the data for unlimited time. However the default setting is 90 days. Within Trends some really nice reports can be created, which also can be used for future predications. Most used will be probably Sessions (to see the amount of sessions over time), logon performance (to check if the user experiences concerning logon times is consistent), load evaluator index (to check if the machine load is changing over time) and machine usage (to see the usage of machines over time). Other reports available are Failures, Capacity Management and Network. Network will not show data, the information is only available with HDX Insight (based on NetScaler). New from version Director 7.7 is the Alerting functionality. Within Citrix Directory you can configure rules called Citrix Alert Policy. Citrix added a set of predefined alerts, where you can configure the threshold for creating a warning or critical message. The alerts are shown in Director. A quick overview is provided on the right side with an amount on the buttons warning and critical. If you click the button some more detailed information is shown. Secondly the alerts can be seen via the Alerts button, followed by the Citrix Alerts tab. Within alerting you have the possibility to add an e-mail notification when the threshold is reached. Besides the information reports Director is also the primary tool for assisting XenApp/XenDesktop users. The starting point for this part of the product is the search button, where you can search for the specific user. After selecting the user an overview of the sessions the user (could) have running are shown. You can select the session you would like to assist the user with. In my case the user has only one active session, but I can see that he is also allowed to connect to another delivery group. After selecting the user the activity manager is shown. Within the Activity Manager you will see the applications the user opened. Also all processes can be seen per user, just like the option to log off the users or shadow the user. More advanced information can be found via the button details. Via the details button three panes become available. First the Activity Manager is shown again in a smaller form. Secondly the details of the machine hosting the session are shown. On the third pane more detailed information is shown about the sessions of the user. When scrolling down more useful information can be found. The logon duration of the user is shown with the information about the latest (current) session, the average of the last seven days and the average of the delivery group (of all users). Also the HDX Monitor information is shown, where you previously needed to install a separate software component. When using the Citrix Personalization feature also, the information about this feature is shown. At the bottom a Network component is available. However this information is only shown as data when using the HDX Insight product as well. In this article we started with the installation of Citrix Director and which configurations are required for optional windows authentication and auto populate the domain name for the IIS authentication. After the installation we discussed the available options within Director including Trends, Filters, Alerts and User Session details.